I bought this cotton twill peacoat, double-deeply on sale and with free shipping at J. Crew. And quite out of character, chose "dark mauve", not the sober navy I have worn in one coat or another most of my life. Even though it was reduced from $CDN 168 to about $55 (plus tax), I am reluctant to buy anything "for later", the gateway attitude to stockpiling. I took a few things to the donation box, then gave it a place in the closet. I hope next spring I'm still happy! I'd enjoy hearing your experience: did an off-season bargain turn out to be worth it, or just a moment's misjudgement? I think it's a lovely color and my best guess is that you will enjoy it next spring. I can't remember the last time I bought a out of season item on sale, but would not hesitate to buy a classic and useful piece like this one. 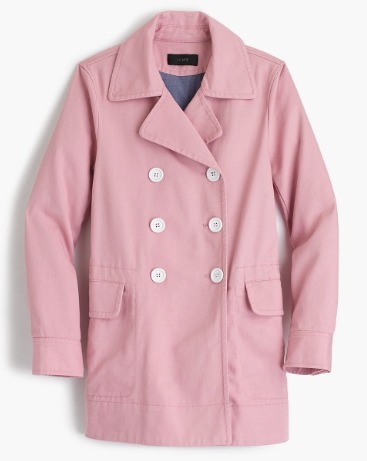 I would love to have a pink spring coat--but we just don't need them here in Texas. I'm envious of your climate! I once had a hot pink silk trench coat. Wore it out! I still buy bright coats for grey days. You will love it. Not impractical at all--just pretty! You can wear it over any neutral and I bet it will look fab with navy (my personal favorite neutral). I love the cute printed trenches out there (like Bodin) but I don't have room for extra coats in my apartment. I bought a navy Balmacaan from Land's End about 10 years ago which has faded a bit to lovely violety-blue. I get so many compliments on its color, and when I tell people how old it is and how it started out, they can't believe it! I don't buy "out of season" but many people find this an economical way to shop. I've had a rose trench coat, worn for 10 years and passed on so it is likely that you will get "wear out of" your new jacket. I hope that you enjoy wearing it because that is really the issue. Love the colour! I could not wear that particular style as I can't wear double-breasted - but in a single breast style - and at that price! I'd grab it! As others have pointed out, pink goes well with so many neutrals that you should be able to get lots of wear out of it. With a sweater underneath could you not wear it for a bit this Fall? I do occasionally buy out of season - sometimes it's just too good a deal to pass up. Two January's ago I bought a classic navy wool coat at The Bay - it's from "Planet" and the original price was nearly $800 - too much, especially since I'd already bought a new winter coat to wear to the office. However, it had been a long time since I had a really good, more formal and dressy winter coat so when I saw this one, in my size, at less than $200 (including tax) - I couldn't pass it up. Enjoy your wonderful pink purchase! Last year, I bought a blue and white striped blazer, also from J.Crew. It looks like seersucker, but it isn't textured. It was marked way down at the end of summer. I normally wear very conservative, solid, somber colors. I have worn it several times this spring and summer and I get so many compliments on it! It's easy to care for and looks nice with so many things. I was worried I'd never have the guts to wear it. I love J.Crew's jackets and blazers. Love it! I think that you are going to wear this coat a lot for many years. You'll get plenty of wear out if the coat, and pink does liven up grey. I bought a dark purple Paul Smith wool coat at the end of the winter this year. It was one of those sales where an additional 25% off was given on sales already reduced 1/2 off retail. Quite the bargain. It arrived from London (ooh la la - free shipping). I took it to a tailor to shorten the sleeves, but it otherwise fits perfectly. Our spring weather in Seattle was too warm to wear the coat, but I hope I still think dark purple goes with my grey next winter. Buying online is always risky, so I now avoid "final purchase" items. I have donated several dresses over the years that looked just perfect on a model only to disappoint at home and on hips. Thanks for the recommendation! Just ordered a navy blue - US $46.00. Yippee! I'd almost have to see it in person - the colour name appeals to me greatly, but I don't wear pastels in any season; in summer I'm more inclined to wear brighter colours. There is no reason you couldn't wear it in the autumn with a scarf that has darker tones as well as echoes of this. I don't wear anything double breasted as try to play down cleavage which remains too prominent although I've lost some weight. But there is a type of pink this season that doesn't seem infantile or tarty. There are cultures from Mexico to India that hold pink in high regard. consumer hint: Sears Canada is going belly-up. Look for deep discounts. Their fashions tend to be out of date, but they are good for staples and excellent for undergarments. Congratulations-- I predict you are going to be delighted to find this in your closet next spring. it's so cheerful and pretty. It would be nice with a cranberry scarf or sweater. Looks like a win/win/win/win to meet. Good shopping! No, not metallic. Perhaps a deeper version of the same shade, as we do have button specialists here. Or why not a light horn colour? I'm getting very cross about bra prospects without Sears (a horribly unfashionable chain where I'd buy nothing else). Not exactly something one can order online without trying on first, and I have no intention of confronting the Nazi she-wolves la Duchesse referenced at a place here - I really don't want to spend the rest of my life in prison for strangling a !@#$%?&* ! I do hope all realise I'm pissed off, not violent. People can be very literal on the net, as there are no visual or voice cues. Hi Everyone: I just love you, button fanatics! They are white, and look OK new, but the minute they scratch, I am thinking silver, antiqued if I could have my ideal- possibly embossed (like those on classic pea coats) with an anchor- it will be fun to look. Leslie Milligan: Your Paul Smith coat sounds like an absolute (purple) treasure- sometimes you get lucky that way. Margie from TO: Planet make some really cool clothes, I always wondered why I only saw it at The Bay. Got stung once on a "final markdown, no return" so avoid unless I am buying a replacement. CK: Fabrics that fade or wear to those soft, mysterious colours are just the best and yo can only wish for that- like perfectly faded jeans. Seaside: If they'd had the navy in my size I'd have been torn, and I am sure it looks crisp and chic. Great buy. Paula: If you knew how long I have searched to replace a silk raincoat I "borrowed" from my mother! They are rare, and. really wonderful. Most raincoats are stiff- a silk is light, warm enough elegant- why aren't there more? JennPez: I agree; the tailoring on their jackets often has that extra detail. Janice: I would say the biggest transition to having definitely grey hair has been more pink- I have a pink-based skin tone and pink works, but can't be too pastel or "baby pink". A year ago I bought a similar colour trench coat. I enjoy wearing it on gloomy or rainy days. In the west we've had many rainy days this spring. It's a pick-me-up. My biggest issue is the need for it to be dry cleaned. Outrageous. Yours can be washed so I think you'll be happy you made this purchase. Oh, I love that coat! You will look lovely in it. Flattering color, classic styling and a bargain to boot! Well done Duchesse! Julie: I have just a handful of drycleaning-required things left now, but coats are often among them. Have passed up pale dryclean- only coats because as in a big city, without a car, they really show dirt. Sometimes the cleaners have coat specials. LauraH: I buy a fair amount off season, things like jeans and EB cashmere, keeping a list of what I need, and a warning note in my calendar that I already have enough when the season rolls round. It's a good way to stretch the budget, though I do have to control myself when faced with 40 or 50% off a still-pricey item I don't need. Jane: Thanks; will apply your encouragement to wear it often. I noticed a young woman in a pink coat at the grocery store late winter/early spring, it REALLY looked great, nice to brighten up that dreary time of year.